Sometimes showing a bit of working class charm is just as good as a big fat piece of bling. Nothing could make this case stronger than a Casio Gold Retro Watch. What began in Japan, Casio has continued to deliver both stylishly and functionally innovative designs since its inception. Hence, to show off some historic prowess with your formal outfit, can give you such a confident class. By keeping things very simple, Casio manages to capture the look of an evening timepiece with an everyday watch. 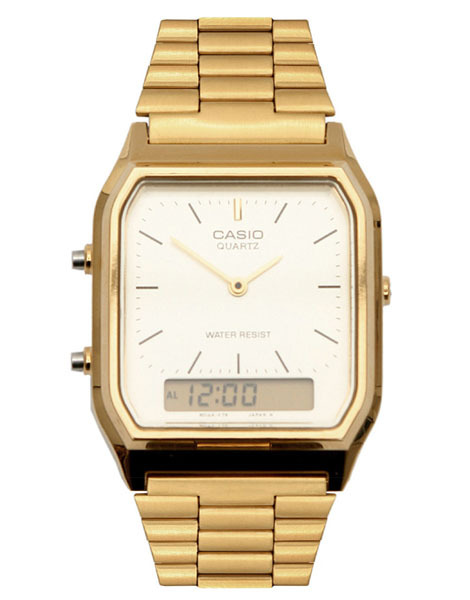 Complete with both a dial and multi-functional digital read out, this gold classic from Casio will bring back a ton of memories. Priced very reasonably and available online. This entry was posted in Accessories and tagged Casio Gold Retro Watch, Japan. Bookmark the permalink.